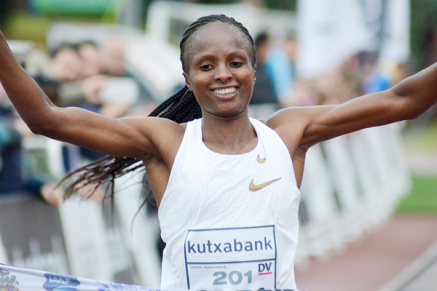 13th January 2019 – Hellen Obiri (KEN) showed the transition from the roads to the country was no problem for her as she took a convincing win at the latest leg of the IAAF Cross-Country series in Elgoibar, Spain. Facing the strongest field assembled so far this season Hellen worked her way into the race before slowly upping the tempo to move clear of her rivals. The combination of heavy mud, hills and even some track did not break her rhythm and she crossed the line in 24:39 for the 6.6km course, twenty seconds clear of the runner up. Hellen now returns to Kenya where she will prepare for the Kenyan Defence Forces Championships and then the Kenyan World Cross Country Trials. Although not victorious in the race there was a very successful comeback for Shannon Rowbury (USA). In her first track outing since the birth of her daughter Sienna, Shannon placed second over 3000m at the UW Preview meet in Seattle, clocking 9:03.00.